Because we provide information regarding alcoholic beverages, including beer, wine and spirits, our Website and Services are generally not intended for End Users under 21 years of age. In the event that any portions of our Website or our Services do not contain information regarding alcoholic beverages and may be applicable to End Users under 21 years of age, we will so indicate expressly. Under no circumstances are any portions of our Website or Services intended for End Users under 13 years of age. The Agreement sets forth your rights and obligations with respect to your access to and use of our Website and Services and use of any and all information or data of any kind arising from access to, or use of, our Website and Services, including, without limitation, any text, graphics, sound recordings, audio, video, and art work. Toasting the Town is the provider of a free e-newsletter subscription and timeless publication, designed to entertain and educate residents of any city, town or village, of the heritage of their local surroundings. Anyone who accesses or uses our Website or Services is an “End User,” as used in the Agreement. To gain full use of the Website and Services, you must create an account with us. You can do this through our sign up process, where you can create an account manually or link to an existing social network account, such as Facebook. To create a Toasting the Town account, we require certain information, such as your first name, last name, email address, city, zip code, a password, gender, and birthdate. You may also elect to provide us certain information that we do not require, such as a range applicable to your income. If you choose to log in to Toasting the Town using a social network account, additional terms and conditions of such social network may apply. From time to time, Toasting the Town may offer as part of the Website or Services certain contests, promotions, simulations, or games (collectively, "Games"). To participate in Games, players may be required to complete a registration form. Upon submission, all registrations become the exclusive property of Toasting the Town. Registered users (each, a "Registered User") are permitted only one account. Registered Users with more than one account are subject to immediate disqualification from any Game, unless the description of the Game expressly invites a user to register multiple times. Toasting the Town, at its sole discretion, may suspend or revoke the registration of any Registered User. Registered Users agree to release Toasting the Town and its agents, advertisers, sponsors or promotional partners, from all liability arising from participation in any of Game located on, or accessed through, the Website or Services. Toasting the Town is not responsible for technical, hardware or software failures of any kind, lost or unavailable network connections, or failed, incomplete, garbled or delayed computer transmissions which may limit any Registered User's ability to participate in any Game. Each Registered User agrees to be bound by the rules of any Game and by the rules of fair play and consideration of fellow Registered User. A Registered User who violates any of the rules or guidelines for behavior published on the Website or through the Services, or on any website where the Game is conducted, are subject to immediate disqualification and revocation of their registration. Some Games may offer prizes to Registered Users. All prizes are subject to the official game or contest rules published with that Game. Toasting the Town is under no obligation to award any prize to any Registered User who violates a published rule or guideline. Toasting the Town reserves the right to cancel, terminate or alter any Game or the rules thereof at any time without prior notification. From time to time, Toasting the Town may produce events and sell tickets through the Website to its events and events produced by third parties. In addition to any rules or policies applicable to a specific event, the following terms and conditions apply to such events and tickets. ALL TICKET SALES ARE FINAL. Refunds on tickets purchased directly from Toasting the Town may be made, at Toasting the Town’s discretion, for a cancelled or postponed event only. In all instances when a ticket is refunded, only the cost of the ticket is refunded. Any fees, including any convenience fees, are nonrefundable. No request for cancellations, exchanges or refunds will be accepted. Presenters, events and programs are subject to change. Tickets bought from a third party seller are not the responsibility of Toasting the Town and must be addressed solely with such third party seller. You must print tickets purchased through the Website prior to the event or be able to display the ticket on your smartphone or other mobile device for inspection and validation upon entry. You may also be required to present a valid photo ID verifying you are over the age of 21 (twenty one) if required for admission to the event. Toasting the Town has the right to deny entry should any ticket, however presented, not be properly validated, should the purchaser or attendee not be able to present a valid photo ID, or for any other reason, in its sole discretion. Toasting the Town will not be held responsible for counterfeit tickets, errors or omissions of third party sellers, duplicate tickets which have already been scanned or tickets that cannot be scanned due to faulty printing. Toasting the Town will make reasonable efforts to troubleshoot scanning issues; however, Toasting the Town retains the right to deny entry should these issues not be the fault of Toasting the Town. Toasting the Town is not responsible and disclaims all liability for technical compatibility or other problems that prevent validation of a ticket. In the case that an event is either cancelled or postponed, Toasting the Town will make reasonable efforts to contact every individual who has directly purchased tickets from Toasting the Town via e-mail, time permitting. Toasting the Town shall not be held responsible or liable for any cost or damage a cancellation or postponement may incur. Toasting the Town shall not be held responsible or liable for injuries, loss or damages incurred by attendees while attending events produced by third parties. Further, Toasting the Town shall not be responsible for, nor does Toasting the Town make any representations or warranties on behalf of, any third parties who may also sell tickets to an event. For events produced by Toasting the Town, you and your guests consent to Toasting the Town’s (and its licensees’) use of your image, likeness, actions and statements in connection with any live or recorded audio or video or photograph or other transmission or publication of any of the events to which you are purchasing tickets. Your attendance at events shall be deemed your consent to appear in such recordings without compensation of any kind and your release of any claims, including claims based on asserted rights of publicity or privacy, related to such recordings. Toasting the Town reserves the right in its sole discretion to remove or exclude attendees from events, including anyone who disrupts an event or anyone who fails to abide by Toasting the Town’s rules and practices. Attendees are expected to act in a responsible manner at all events, including in the drinking of alcohol. YOUR ATTENDANCE AT ANY EVENT PRODUCED BY TOASTING THE TOWN OR ANY EVENT PRODUCED BY A THIRD PARTY FOR WHICH TOASTING THE TOWN SELLS TICKETS IS CONSTITUTES YOUR ACCEPTANCE OF THIS AGREEMENT. 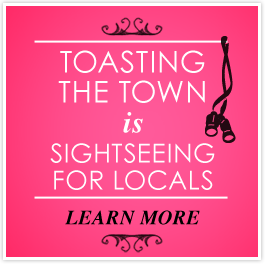 Please note that tickets to Toasting The Town Events may be available through third party distributors, business partners, and vendors of TTT, potentially at rates lower than those available directly from Toasting The Town. Nevertheless, all direct sales from the Toasting The Town website (www.toastingthetown.com) are final and no refunds are available except at the sole discretion of Toasting The Town. For any special matters, concerns, complaints or emergencies, please feel free to email events@toastingthetown.com for further consideration. Our Website and Services are offered solely for entertainment purposes. We take pride in our original content and go to great lengths to cite sources and provide accurate historical information. Nevertheless, errors, inaccuracies, and omissions sometimes occur. We reserve the right to correct any errors, inaccuracies, or omissions and to change or update information at any time without prior notice. Toasting the Town makes no guarantees whatsoever as to the completeness, timeliness, correctness, or accuracy of the materials or data on our Website or provided through our Services. Toasting the Town shall have no liability for any errors or omissions in the information provided on our Website or through our Services. If you believe any portion of our Website or Services includes an error or inaccuracy, please notify us. Certain materials on our Website and provided through our Services are protected by intellectual property laws, including but not limited to U.S. copyright laws. You expressly acknowledge and agree that the content accessible within our Website and through our Services is the property of Toasting the Town and its content providers, and Toasting the Town and its content providers retain all right, title, and interest in the content. Subject to the terms of this Agreement, you are granted a limited, personal, non-exclusive, non-sublicensable, non-assignable, non-transferable, and revocable license to use our Website, the Services, and related materials solely for your own personal non-commercial use. Except as expressly provided, all rights are reserved. Among other things, except to the extent required for the limited purpose of reviewing material on our Website and through our Services, electronic reproduction, adaptation, distribution, performance, or display of our Website or Services, or any portion of our Website or Services, is prohibited. Changes to author attribution or copyright notices are prohibited. Use of any of our trademarks as meta-tags on any other website is also strictly prohibited. You may not display our Website or Services, or portions thereof, in things (e.g., framing, scraping, etc.) without our express written permission. You agree to cooperate with us to cause all unauthorized co-branding, framing, scraping, or linking to immediately cease. For further information on intellectual property matters contact: info@toastingthetown.com. You further agree not to circumvent, disable, or otherwise interfere with security related features of the Services offered by Toasting the Town to End Users or any other features that prevent or restrict the use or copying of any related materials. Toasting the Town reserves the right to cancel an account, refuse End User registration, or deny access to our Website or Services at our discretion and for any reason, including any breach of the Agreement. Our Website and materials provided through our Services may refer to physical venues, geographical sites, websites on the Internet, and/or products or services that are not under the control of or maintained by Toasting the Town (“Third Party Properties”). Unless expressly stated to the contrary, such references do not constitute an affiliation with or endorsement by Toasting the Town of any such Third Party Properties. You acknowledge that Toasting the Town is providing any references to such Third Party Properties to you solely as a convenience to you, and you agree that Toasting the Town is not responsible for any injury, harm, damages, or negative experience you may encounter by accessing, visiting, or using such Third Party Properties. Toasting the Town does not endorse or make any representations about any Third Party Properties. If you access, visit, or use any Third Party Properties referred to on our Website or through our Services, you do so at your own risk. Our Website and materials provided through our Services may contain materials submitted by third parties. Any such materials are provided solely as a convenience to you. Unless expressly stated to the contrary, Toasting the Town has not tested or evaluated these materials and does not endorse or make any representations about these materials or your use thereof. If you use any of the third party materials, you do so at your own risk. In no event shall Toasting the Town be liable for any loss, claim, damages, or costs that may arise in connection with your use of these materials. It is not possible to operate our Website or Services with 100% guaranteed uptime. Toasting the Town will make reasonable efforts to keep our Website and Services operational. However, certain technical difficulties, routine site maintenance and upgrades, and other events may, from time to time, result in interruptions to or outages of our Website or Services. In addition, Toasting the Town reserves the right at any time, and from time to time, to modify or discontinue (on a temporary or permanent basis) certain functions of our Website or Services, with or without notice. You agree that Toasting the Town shall not be liable to you or to any third party for any direct or indirect consequence of any modification, suspension, discontinuance of, or interruption to our Website or Services. You expressly agree that access to and use of OUR WEBSITE and Services are at your sole risk. OUR WEBSITE and services Are provided on an “as is” and an “as available” basis. Toasting the Town does not make, and hereby disclaims, any representations or warranties, express, implied, or statutory, regarding (a) OUR WEBSITE and Services; and (b) any products and services offered through OUR WEBSITE and Services, or any portion thereof, including (without limitation) implied warranties of merchantability, fitness for a particular purpose, title, non-infringement of third party rights, and any warranties arising by course of dealing or custom of trade. Toasting the Town makes no representation or warranty that any material, content, products, or services displayed on or offered through our Website or Services are accurate, complete, appropriate, reliable, or timely. Toasting the Town also makes no representations or warranties that OUR Website or Services will meet your requirements, or that your access to and use of OUR WEBSITE or Services will be uninterrupted or error-free, free of viruses, malicious code, or other harmful components, or otherwise will be secure. Some jurisdictions do not allow the exclusion of certain warranties. Accordingly, some of the above exclusions may not apply to you. To the maximum extent permitted by applicable law and notwithstanding any other provision of this Agreement, in no event shall Toasting the Town or any of its affiliates or suppliers (including any of its or their partners, officers, employees, agents, contractors, successors, or assignees) be liable to you (including any of your partners, officers, employees, agents, contractors, successors, or assignees) for any indirect, special, incidental, exemplary, punitive, or consequential damages, whether arising in contract, equity, negligence, intended conduct, tort, or otherwise (including breach of warranty, negligence, and strict liability in tort), including, without limitation, damages arising from delay, loss of goodwill, loss of or damage to data, interruption in use or availability of data, loss of use of money or use of products, lost profits, revenue or savings (actual or anticipated), or other economic loss ensuing from or in connection with (a) the Website or services; or (b) any products and services offered through the Website or services, or any portion thereof, even if Toasting the Town or any of its affiliates or suppliers has been advised of the possibility of such damages. These limitations shall apply notwithstanding the failure of the essential purpose of any limited remedy. Despite the foregoing limitation of liability for damages, if a court or other tribunal of competent jurisdiction decides to award monetary damages to you for any claim or cause of action arising from the same, the amount of monetary damages for such claim or cause of action shall be no greater than the greater of: (A) the amount you paid to Toasting the Town for products and services in the last month and (b) one hundred U.S. dollars ($100). You agree to indemnify, defend, and hold harmless Toasting the Town, its parents, subsidiaries, and affiliates, and its and their respective directors, officers, partners, employees, agents, contractors, successors, and assigns from and against all claims, demands, lawsuits, damages, liabilities, losses, costs, or expenses (including, but not limited to, reasonable fees and disbursements of counsel and court costs), judgments, settlements, and penalties of every kind arising from or relating to any violation of this agreement and any activity related to your use of the Website or services. You agree that Toasting the Town may, in its sole discretion and without prior notice, terminate your access to or use of any of our Website or Services at any time and for any reason, with or without cause. You also agree that any violation by you of the Agreement will constitute an unlawful and unfair business practice that will cause irreparable harm to Toasting the Town for which monetary damages would be inadequate. You consent to Toasting the Town’s obtaining any injunctive or equitable relief that Toasting the Town deems necessary or appropriate in such circumstances, without the need for a bond. These remedies are in addition to any other remedies Toasting the Town may have at law or in equity. Toasting the Town is committed to resolving any copyright infringement issues according to the Digital Millennium Copyright Act as outlined in this Notice and Takedown Procedure. If applicable, we will attempt to notify the alleged infringer of the copyright infringement notification and point them to the procedure for counter-notification. We will not share your personal information with the alleged infringer. If we receive a relevant counter-notification from the alleged infringer, we will forward it to you. You will have ten (10) days to notify us that you have filed an action seeking a court order to restrain the alleged infringer from engaging in infringing activity relating to the material on Toasting the Town’s Website or Services. If we receive such a notification, we will not restore the material. If we do not receive such notification, we may reinstate the material. To file a counter notification with us, you must provide a written communication that sets forth the items specified below. Please note that under Section 512(f) of the Copyright Act, any person who knowingly materially misrepresents that material or activity was removed or disabled by mistake or misidentification may be subject to liability. Please also be advised that we enforce a policy that provides for the termination in appropriate circumstances of subscribers who are repeat infringers. Accordingly, if you are not sure whether certain material infringes the copyrights of others, we suggest that you first contact an attorney. A sample counter notification may be found http://www.chillingeffects.org/dmca/counter512.pdf. Counter notifications should be sent to the email or postal address identified above. After we send out the counter-notification, the claimant must then notify us within 10 days that he or she has filed an action seeking a court order to restrain you from engaging in infringing activity relating to the material on Toasting the Town’s Website or Services. If we receive such notification we will be unable to restore the material. If we do not receive such notification, we may reinstate the material. At any time and at Toasting the Town’s sole discretion, we may add, delete, or modify the Agreement or our Website or Services. Should you deem any such addition, deletion, or modification to the Agreement unacceptable, you shall stop accessing, and/or using our Website or Services. All changes to the Agreement shall be effective immediately. By accessing and using our Website or Services, you acknowledge and agree that Toasting the Town controls and operates all parts of the Website and Services from its offices in the United States of America. Unless expressly stated to the contrary, the Website and Services are intended for viewing and use in the United States. Unless expressly stated to the contrary, Toasting the Town makes no representation that the materials are appropriate or will be available for use in other locations outside of the United States. Unless otherwise explicitly stated, all marketing or promotional materials found on or accessible through our Website or Services are solely directed to individuals, companies, or other entities located in the United States. Toasting the Town reserves the right to limit, in its sole discretion, the provision and quantity of any feature, product, or service to any person or geographic area. Any offer for any feature, product, or service made on or through our Website or Services is void where prohibited. If you use our Website or Services from outside the United States of America, you are entirely responsible for compliance with applicable local laws and other applicable laws. You may not use any portion of our Website or Services in violation of United States export laws and regulations. Any action related to the Agreement will be governed by the laws of New York, without regard to the choice or conflicts of law provisions of any jurisdiction. You and Toasting the Town agree and consent that jurisdiction, proper venue, and the most convenient forums for all claims, actions, and proceedings of any kind relating to our Website, our Services, or the Agreement will be exclusively in the federal or state courts located in New York, New York. Toasting the Town intends to resolve any and all disputes that may arise between it and its End Users in a cost-effective and non-disruptive manner, preferably without the time and expense of litigation. Toward this end, you agree to the following dispute resolution procedure. If you are unable to resolve any dispute in the ordinary course of business, you shall send a written notice to Toasting the Town in which you outline the issues in dispute, enclose any relevant documents, and state the requested relief. Toasting the Town shall respond within ten (10) business days with identical information from its perspective. You and a representative of Toasting the Town shall meet or communicate electronically within ten (10) business days of the delivery of the response, and as often as you and Toasting the Town mutually deem necessary or desirable thereafter, in an attempt to resolve the matter. If, within sixty (60) days of the first communication, you and Toasting the Town fail to resolve the matter, you may then proceed to litigation in the forum described in Section 15.4 above. In operating our Website and providing our Services, Toasting the Town does not solicit nor does it wish to receive any confidential, secret or proprietary information or other material from you through the Website, the Services, our mail and e-mail addresses, or in any other way. Any information or material submitted or sent to Toasting the Town will be deemed not to be confidential or secret. By submitting or sending information or other material to Toasting the Town you represent and warrant that the information is original to you and that no other party has any rights to the material. By communicating with Toasting the Town, including submitting or sending content to us, you grant Toasting the Town the royalty-free, unrestricted, world-wide, perpetual, irrevocable, non-exclusive, and fully sublicensable right and license to use, reproduce, modify, adapt, publish, translate, create derivative works from, distribute, perform and display such content (in whole or part), including any information, suggestions, ideas, drawings or concepts contained in such content, worldwide and/or to incorporate it in other works in any form, media, or technology now known or later developed. Such license includes incorporating the content, in whole or in part, into a Toasting the Town feature. You will remain responsible for the accuracy, copyright compliance, legality, decency, or any other aspect of such submitted material, including any content or part thereof, or other communication to Toasting the Town. You also warrant that any "moral rights" in such content is waived. If Toasting the Town does take any legal action against you as a result of your violation of the Agreement, Toasting the Town will be entitled to recover from you, and you agree to pay, all reasonable attorneys’ fees and costs of such action, in addition to any other relief granted to Toasting the Town. You agree that Toasting the Town will not be liable to you or to any third party for termination of your access to, or use of, any of our Website or Services as a result of any violation of the Agreement or for any reason at all. You may not assign, by operation of law or otherwise, any rights or delegate any duties under the Agreement to any third party without prior written consent by Toasting the Town. Any purported assignment lacking such consent will be void at its inception. Toasting the Town may assign all or part of its rights and/or delegate all or part of its duties under the Agreement to any party, at any time, and in its sole discretion, upon notice of assignment by posting such notice on our Website or through our Services.